I called Kevin baffled at why the key wasn’t working. He said, “Well isn’t your key usually attached to your water bottle?” That’s one of my hair tie hacks – which turns out only works if you actually bring your water bottle with you. 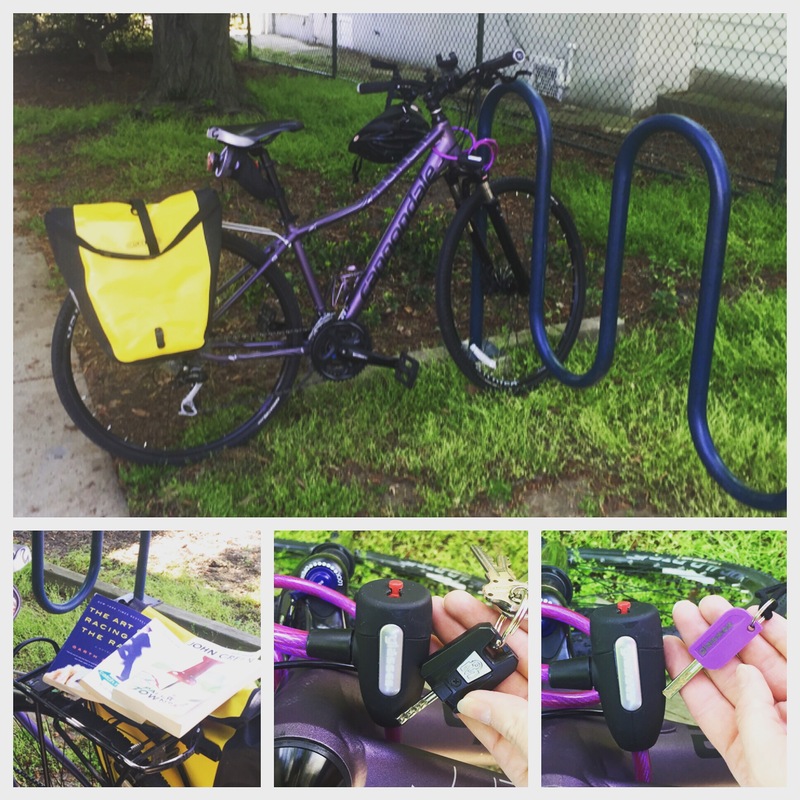 “Oh yeah,” I replied, “Ummm…I left that at home.” Turns out the key on my keyring is to my OLD bike lock. Oops! Luckily Kevin works from home and was able to swing by and drop off the correct key and I was on my way home. Saturday I met up with a girl I knew who was selling her road bike because she was moving. It’s far from my dream bike, but the price was right and it was purple so I went to check it out. I couldn’t test ride it because the tires were flat and I didn’t think to bring the adapter for the presta valve, but she is the same height as me and had a bike fitting when she got it. The bike has barely been used over the 2 years she has had it so I decided to take it and if I didn’t like it I would just resell it myself. I took it over to the bike shop that I love and had them switch out the pedals (she had the clipless pedals and I don’t have those shoes, nor do I care to learn to ride that way right now – I’ve been injured enough this year!!). I had them put on pedals that have the cage and strap that goes over my feet – I figured that would be a good compromise. They also adjusted the gears for me a bit and put air in the tires. When I got home I took the bike around the block a few times to test it out. I gotta say I am pretty excited about the drop handlebars, but my left shoulder started to feel pinched – I think this was just because it’s a totally different feel/way to ride so I was a bit nervous. So happy for you! See, you took the time to heal and now you even have a new bike to ride! Love the cartoon, very funny! Happy bicycling! I’ll never forget getting to know a friend of mine when she said, “We ride, ” I replied “yeah, I had a bike but I need to get a new one,” and she said, “no, not that kind of ride,” (meaning motorcycles). Ha ha ha ha. yup! thanks for all your support! 🙂 Still not 100% but wayyyy better than I was! That is so funny about the motorcycle! I gotta say I get excited when I’m cycling and see a motorcycle and they give me the wave – like I’m part of the motorcycle gang! 🙂 We’re both bikers! haha!